1968, 1969, 1970 Shelby Mustang Registry from the Shelby American Automobile Club. 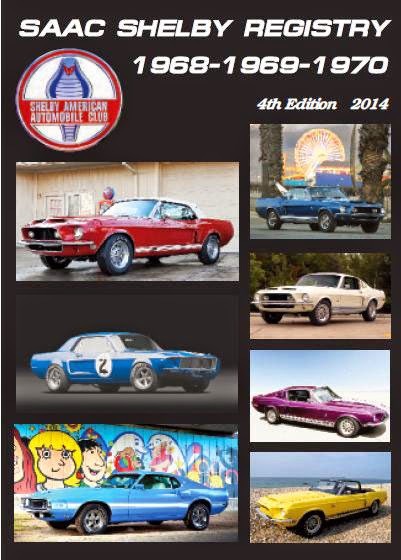 We now have the new Shelby American Automobile Club Registry for 1968, 1969, and 1970 Shelby Mustangs. This 2014 4th Edition just came out and is a great compliment to the 1965, 1966, 1967 Shelby Mustang Registry (part number LT-58). Both of these books are considered the "Bibles" of Shelbys. It has been 14 years since the last Registry was printed and in that time SAAC has compiled a stunning amount of new information and has dug even deeper into the production history of these unique cars. Printed in hardcover, and 1,471 pages thick, this book has the serial number and individual history of every Shelby Mustang built in 1968, 1969, and 1970. Also included are separate, detailed chapters on competition cars, prototypes, drag cars, and unique models. Appendix pages include paint codes, serial number locations, a list of mechanical components, explanation of DSO codes and a glossary of terms unique to these cars. But wait! There's more! A list of unique parts for each year, specification pages, production figures, production statistics, and an index of past owners. If you own a Shelby Mustang, are thinking about buying one, or just love the cars, you absolutely have to have one of these books. Click here for more information and to order. Our part number is LT-581.